You may do a lot of researches and explore extra resources, integrate your experiences and perform different activities to result an informative and interesting posts on your blog. Blogging can be your passion, but on the other hand your expectation is to share knowledge with the audience who really interested in your content as they can make use of yours. Have you ever thought about a convenient solution for your readers to share your posts or articles with interested parties? By default, Blogger has standard share buttons which allows your readers to share your posts. But you may notice that it's limited to few popular networks. If you prefer to let your readers share on more networks, we have already discussed about adding more share buttons with AddThis and you can even have a Floating Vertical Share Bar too. Those both blog posts were based on AddThis sharing solution, and it has eye catching share buttons and cool features for publishers. But now I'd like to introduce ShareThis, as another popular solution for sharing content on your blog. ShareThis helps visitors share your content on popular networks such as Facebook, Twitter, Google+, Pinterest and so on. The functionality is similar to AddThis, but they have an identical style for their share buttons which you may fall in love with ShareThis in first place. Except for stylish share buttons and opening doors for multiple networks, they provide real-time analytics for user shares happening on your blog. As ShareThis offer reports on sharing statistics, you can track down which topics matter to your audience too. You need to have a ShareThis account to continue with below process. If you don't have an account already, register for a new account. 4. 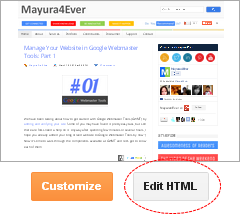 Click Edit HTML button underneath your blog preview. 5. Now find </head> in your template. 6. Add following ShareThis script right before the </head> tag. Here you can enable Multi-Post (Oauth) style or Direct Post (Classic) style. Specify true to enable Multi-Post style and false to enable Direct Post style. Multi Post Style - Let people share your content to multiple networks at once without leaving your blog. Direct Post Style - People will redirected to particular site when clicking on button. For example, if an user clicks on Facebook button, he will be redirected to Facebook to complete sharing. Add your ShareThis publisher key here. If you don't know your publisher key, you can find it at My Account page. Here you can enable or disable shortening your links with ShareThis when sharing. If you wanna enable shortening, change the value as true here. 7. Now search for <data:post.body/> in your template and add your preferred button code snippet right after <data:post.body/>. Enter your Twitter username here if you wanna mention your Twitter username when sharing. Else leave it blank. Here you can specify a custom button label or text to be reflected on respective buttons. Remove this line if you wanna remove Google +1 button from your share buttons. Remove this line if you wanna remove Facebook Like button from your share buttons. 8. Now save your template. * You can find the all statistics for shares happened on your blog via ShareThis Metrics Dashboard. * If you wish to customize your buttons and its functionality further, you can refer ShareThis Customization Overview. I same issues (again) I added it through their website but because of my image instead of Read More text doesn't fit properly. I can't find the code in html section either. What to do ? You have added it as an element on Layout page. That's how ShareThis website let you add share buttons for Blogger. Try positioning ShareThis element, or remove element and add the Share button code manually. Can the @twitterusername be added to this twitter share like the AddThis one? Thanks for popping up with this question :) Yes you can. I just updated this post with that capability. Just add your preferable code snippet to your blog dear. Oh mobile? I have to agree with you dear :) As most sharing buttons are dynamic, they are having issues when rendering on mobile. You have to try a separate share button for Facebook as ShareThis got. thanks for your suggestion. I faced the similar problem, now it working fine. I appreciate your HARD WORK from my heart, and I mean that. Eariler, I can add buttons from Sharethis site but they share only Homepage. Almost disappointed, but after i do as you teach slowly, share buttons do their good work. If you don't write step by step and very detailed, I guess I would change buttons. thank you very much. p.s. sorry for my poor eng language. Thanks for coming by and sharing your experience on adding share buttons :) Really appreciate your genuine compliments and it motivates me to keep on doin' it mate. The code snippet you pointed is what need to function ShareThis buttons mate. Removing it will stop ShareThis from working on your blog. Anyway I've added that option to coding and updated this post :) You can try it out if you are referring to the shorten links. i have some problem. when I click share buttons in my post, it should +1 in count number bubble but when I refresh the same page, it still "0" ? Just clicking on the button won't count though it appears so :) Did you try sharing it and refreshing the page? Hi there, thanks for the informative post! I am wondering if you could tell me how to remove my default blog title from the tweet in sharethis? I just want users to tweet the post title, url and @mytwittername not my blog title at the beginning. How do I remove that? I have searched everywhere. Thanks! In that case you have to change the title structure of your blog :) ShareThis use the title appears on your pages. You can refer to this post on changing your page titles ~ How to Customize the Page Title in Blogger. Thanks for your help. I was having a hard time with the directions you posted in that post. I did find another easier solution here. http://www.yanniel.info/2010/09/blogger-remove-blog-post-title.html Thanks though! Alrighty Tasha :) Glad to hear you have made it. You're welcome Nerline :) Glad to help you out here. Strange indeed! I haven't found anything wrong with your code either. Mayura, where am I adding the publisher key for sharethis after blog posts? Thanks! Mayura I did find it but not working, does it work with dynamic views? Thanks! You can try vertical sharing widget though ~ Add Floating Vertical Share Bar for Blogger Posts with ShareThis. Thanks my friend - I was wondering why I was having such a hard time with it. My other option is to keep their's but how do I had my own Twitter name? No Lisa. Yet there's no workaround or vertical share bar. Can the linkedin share button or the sharethis buttons be added to a blogger dynamic view template?